The van takes the familiar curves and we know exactly when to turn our heads to the left for the next beautiful view. “This is our last time”, we look at each other with tears in our eyes, “Let’s make the most of it” and brace ourselves for a series of hard goodbyes. 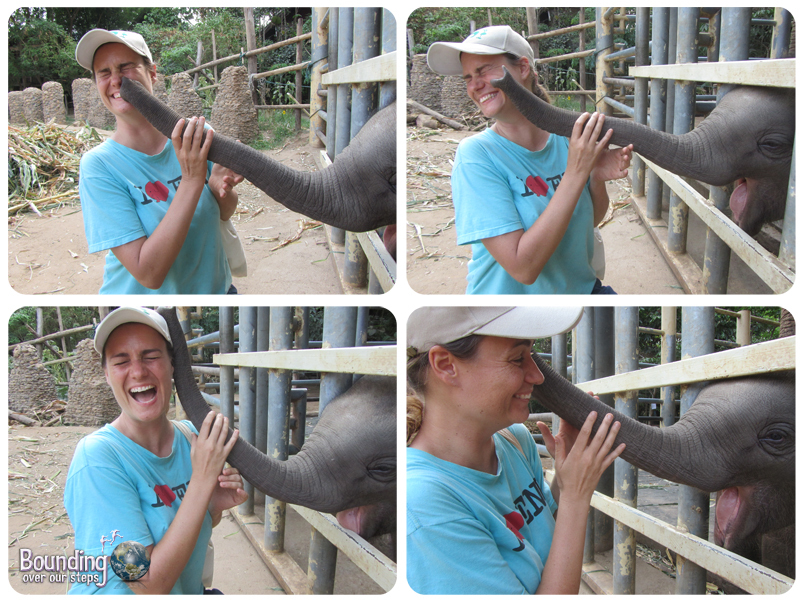 Ever since volunteering for a week when we first arrived to Thailand, Elephant Nature Park had been the biggest part of our lives for the previous 2 1/2 years and never a day went by that it wasn’t on our minds. As we went to say goodbye to the elephants, we knew we were also saying goodbye to the life we had made for ourselves in Thailand. And naturally we found ourselves reflecting on the past couple of years. 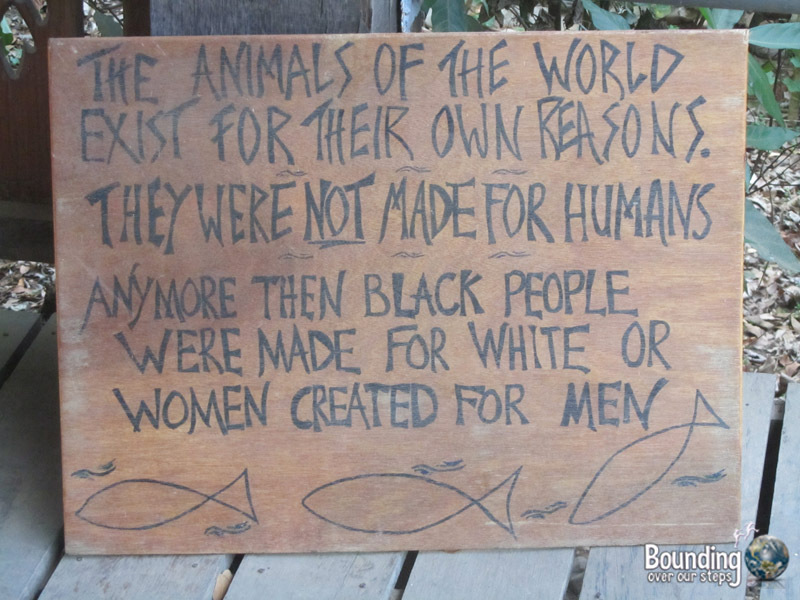 After our volunteer week at ENP we discussed the possibility of going vegan, seeing the hypocrisy of specism, where some animals are deemed worthy of our protection and yet others are not. 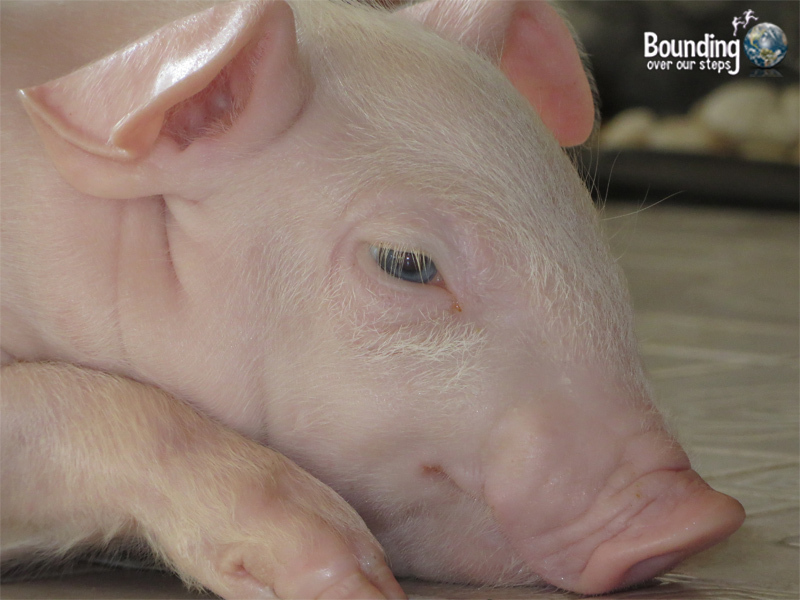 The more we learned about the egg and dairy industry the more we realized that making the step from vegetarian to vegan was the right thing to do. This sign, that was prominently displayed at the platform at ENP, sealed the deal for us. 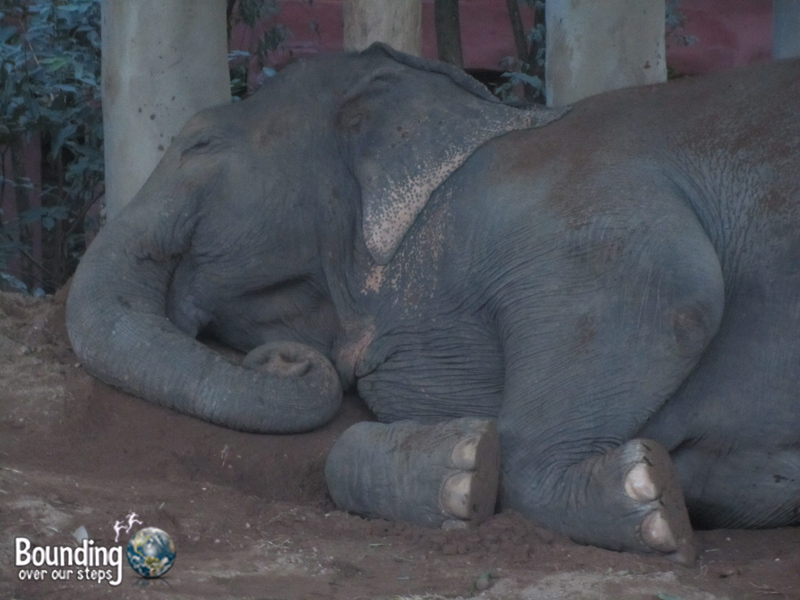 Not long after we arrived in Thailand we were told an elephant rescue was in the works and Mindy was invited to join. Despite her extreme motion sickness, she went along on the very long travel day to and from Surin. This was a life-changing event in so many ways. Read Mindy’s detailed account of this rescue here. Only two months later an elephant named Lucky was to be rescued and Mindy participated in this journey as well, this time spending the majority of the time with Lucky in the back of the truck. When Lucky arrived to ENP after such a long travel day, she simply stood up on her hind legs and turned around and walked off the truck front first – she clearly had gotten on and off trucks a lot in her life. A crowd had gathered of course to greet her and I guess I happened to be standing in just the perfect place because she came right to me. I handed her some bamboo that we had gathered for her (we had been told that she likes bamboo) and said, “Welcome to Elephant Nature Park” as tears welled up in my eyes. Seeing Lucky also meant finally seeing Mindy after what seemed like an eternity of her being away. She had stayed on the back of the truck with Lucky for over 8 hours, talking to her and feeding her. She told her all about ENP and her beloved Dani and the other elephants that she would meet at the park. Lucky was whole-heartedly welcomed at ENP and quickly befriended Dani after her arrival and we always wondered if that were a coincidence. Read more about Mindy’s experience here. A baby elephant only a few days old arrived after his mother had rejected him for reasons unknown. This was our first time meeting a baby elephant and oh my god, everything was just so cute: The trunk, the little legs, the tail, the little bum, the ears, oh my god the ears! He seemed in good spirits despite his rejection and was super curious about everything and of course every visitor was curious about him too. Concern rippled through the park though as to his delicate situation regarding not getting any anti-bodies found only in the mother’s milk. Without this Raja Gaja’s future was precarious and uncertain. The nurturing continued and Raja Gaja was never without someone loving him, whether it be watching him sleep, feeding him, or playing with him. He was such a joy for everyone in the park. But, soon he began having diarrhea and those familiar with animals knew that this was the beginning of the end. He was loved up to the absolute last second of his life and died with people around him who had loved him unconditionally since his arrival at the park. The next day, we witnessed another first in Thailand: a Buddhist funeral replete with chanting monks, incense and flowers all for the baby elephant that had brought so much joy to so many lives for a short time. With the death of Raja Gaja no one had any idea that a baby elephant was just around the corner. 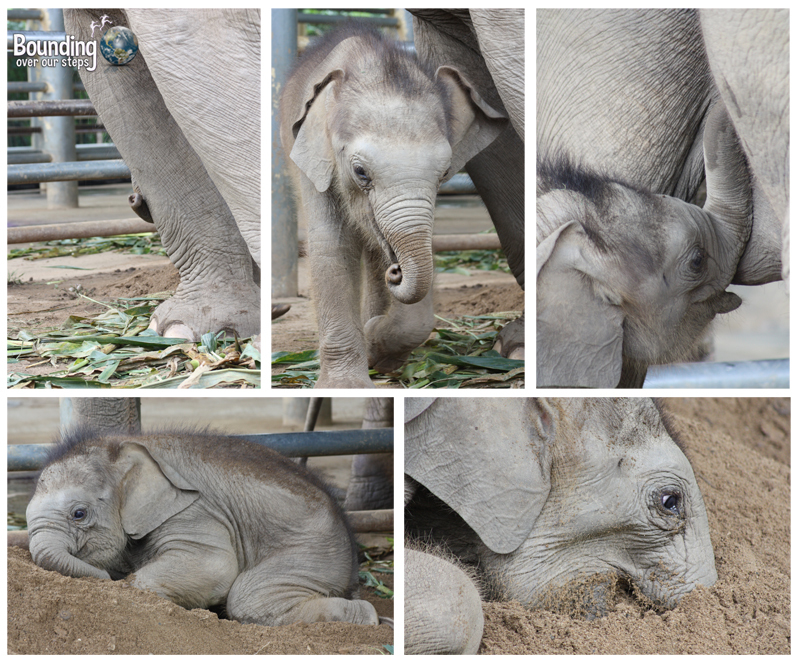 Sri Prae surprised everyone when she gave birth to a baby boy that was named Navann, who of course got lots of attention from everyone (and still does) from people and elephants alike. What an exciting time at the park! Mahout Dam, who had just lost Mae Kham Gaeo, was heart-broken and had decided to leave ENP – that is until he took one look at Navann and decided to stay and become his mahout. Some of the most exciting events were watching Navann discover water for the first time and enjoying an outing to the river. Everyone was still getting used to the idea of having baby Navann around when a second surprise arrived. Dok Ngern gave birth one night to a beautiful baby girl named Dok Mai. She was taller than Navann when he was born and I just loved watching her discover the things her trunk could do. I spent entire days sitting next to her enclosure just watching her love her life, knowing that she will never be the subject of the pajan and will grow up in a loving and nurturing environment. It turned out that I had gotten so much footage of my time with her that we were able to create a short video, “Compilation of Cute” which ended up getting featured on a couple of “cute sites”, such as cuteoverload.com. 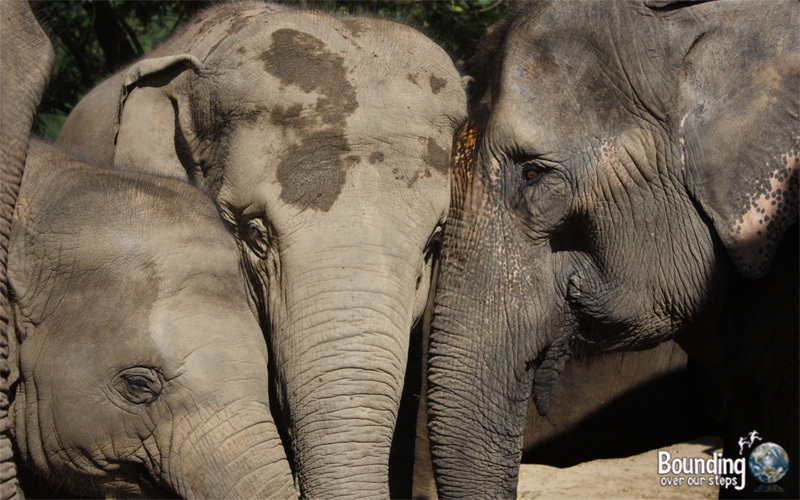 Pretty soon Dok Mai was free to leave her enclosure and join the rest of her Mom’s herd. She can still be seen bouncing around the adult elephants. And yet another surprise was when Mintra, the social butterfly of the park, gave birth to a baby boy called Yindee. People started to wonder how many more surprises we might be in store for. He of course, being the youngest, is one of the most popular elephants to watch by the day visitors, and really who can blame them – he is adorable! One of the greatest achievements we witnessed during our time working for Save Elephant Foundation was the creation of chain-free shelters. Elephant herds are now able to interact with each other at night with no chain around their ankles holding them back. One of the happiest events was finally getting Jungle Boy off his chain (necessary because he was in must and could therefore harm other elephants and people) and into his own large enclosure, complete with a nice swimming pool. Hope was given his own enclosure as well and has been seen enjoying his pool many times. 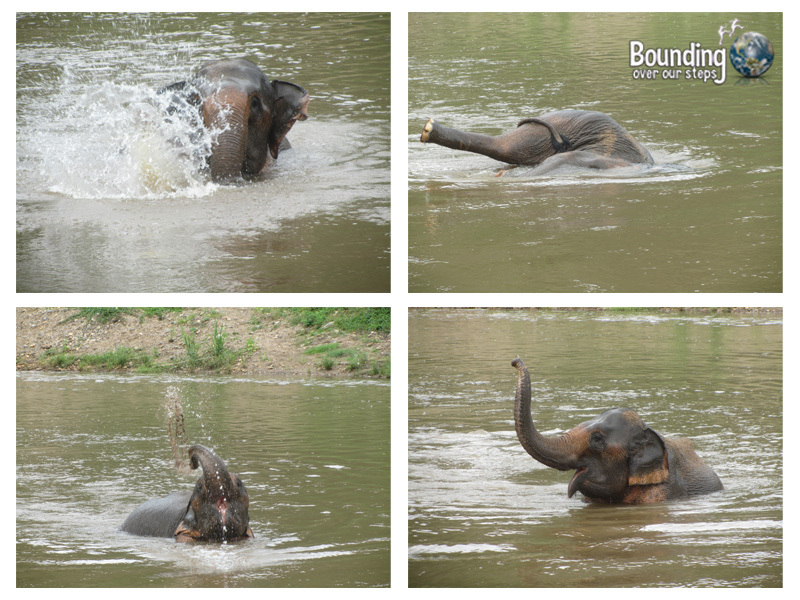 Thai Koon’s arrival sparked a lot of curiosity and interest of both people and elephants at ENP. Many elephants came to meet the new arrival but Dani immediately took such a liking to her and even started disciplining her…kind of the way a mother would. 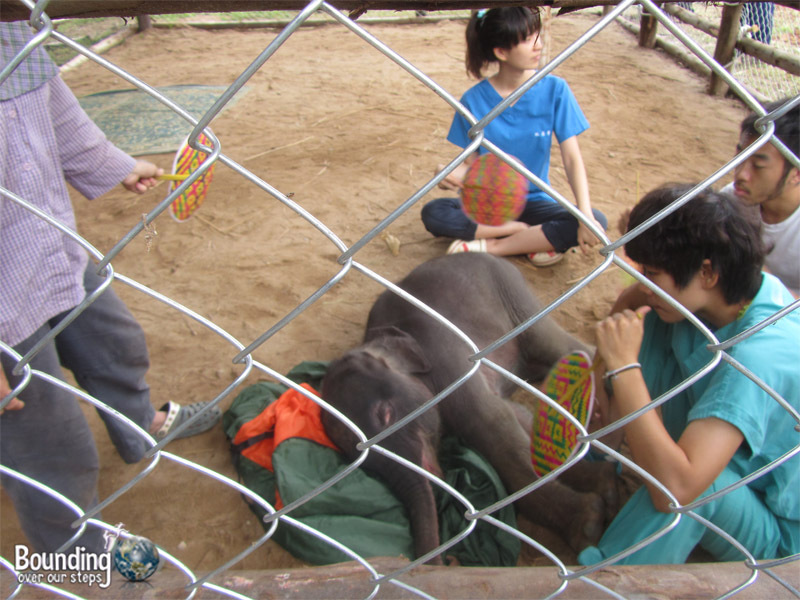 As it turned out Thai Koon had been rescued from the same area as Dani, and Dani did have a daughter that had been taken from her before she had been rescued by ENP and Thai Koon’s age was the right age. Everyone wanted so much for Thai Koon to be Dani’s long lost daughter as this would make a wonderful reunion. Perhaps a DNA test will be done in the future but for now we are simply happy to see that another elephant happy and free at the park. It was clear right away that Pornsawan was a different sort of elephant; she was tough and head-strong and always went after what she wanted no matter what obstacle was in her way. Although we were intimidated by her, it was hard not to admire her tenacity and so we loved her right away. To learn more about her incredible and ever-changing life, click here to read Jodi’s wonderful account. The death of Mae Tee came as we were living at ENP for a few weeks and although it was a very sad event, two aspects made us cry tears of joy: 1) She died naturally at an old age after experiencing friendship, love and freedom at ENP and 2) she has now rejoined her friend Mae Kham Gaeo, who had died just before we arrived in Thailand. To read about Mindy’s experience of Mae Tee’s funeral, click here. Even if you were never to see a dog at Elephant Nature Park, you’d be able to hear them as sometimes it seems like the entire mountain is barking. As one does, we fell in love with certain dogs. It was wonderful to see a devoted staff to help rescue and rehabilitate so many dogs in need, most of whom are street dogs. 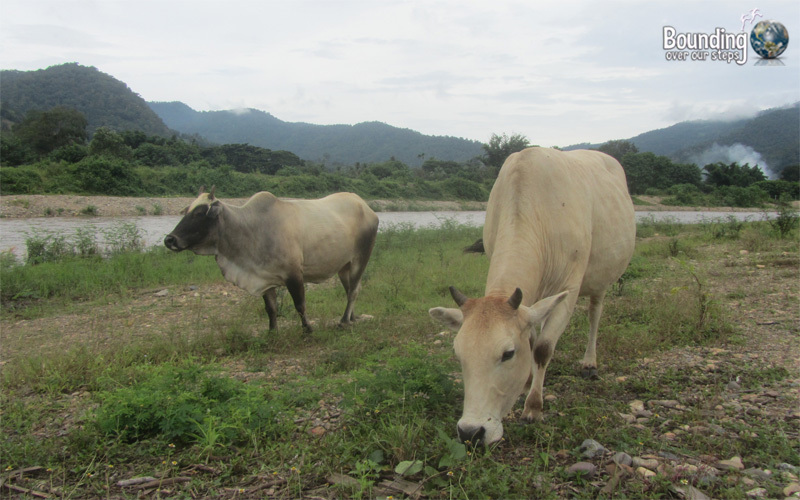 Navi and Feli, as we came to call them, are two most wonderful cows that Lek rescued from the meat industry. They know to get out of the way once the elephants wake up and roam the park for the day but we knew to look for them just behind the kitchen in the mornings and the most prominent time was at dinner when they would come around to visit. We learned that they love bananas – who knew the cows liked bananas?! Much to our own surprise our hardest goodbye turned out to be not to an elephant at all, but to a pig. She was rescued from her mother who had died in childbirth and we held her at only 5 hours old. We help care for Sod Sai in the office and took such delight in watching her grow and her personality develop. She eventually moved to the park where we visited her every chance we got. Being a part of Sod Sai’s life is what led us to the decision to open an animal sanctuary when we got back home to the States. I wonder if she is aware of how much she has affected our lives. I think she knew we were leaving because while she is normally chipper and very boisterous, the day we said goodbye while she initially came running to us as always, she quickly became somber when our tears came. She also let us pet her longer than usual. Upon leaving she put her front legs up on the wooden fence to watch us walk out of the wooden gate. Hardest goodbye ever! Where was your hardest goodbye? Wow, what a great post. You ladies really had the experience(s) of a lifetime and we are in awe of your devotion and dedication. 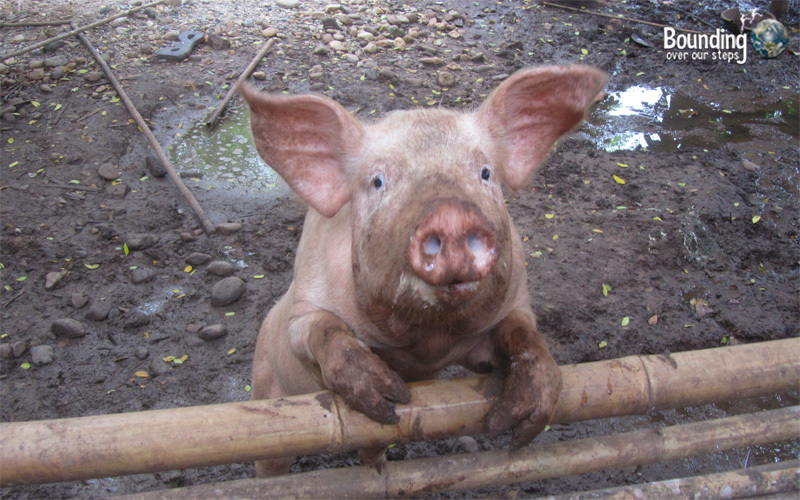 Interestingly, it was pigs that prompted us, some 10 years ago now to become vegetarian. Such beautiful, intelligent creatures. So, is that the plan to open a sanctuary in the US?? We would love to hear all about it and if you need any help we would be keen to know more and to help out if it is at all possible. Do keep us posted. Thanks for a beautiful summary. Too bad Vermont is too cold for elephants. I couldn’t imagine saying goodbye to all those beloved animals. It was hard enough to leave ENP after just one day, hope it’s not truly the last time and you get to visit again some day. OK, I am super emotional today and reading this just made me all teary AGAIN. What memories. I often think how hard it would be for me to walk away from this, but the most important thing is to be able to treasure those moments which we hold dear. Beautiful post ! Definitely can’t wait to get there and meet the herd and Lek whom we’ve been following for a while. Thanks for sharing these emotions! What a fantastic read. I really enjoyed hearing all the adventures you hadwith all the animals at ENP. Im sure these adventures will stay with you all your lives. I only spent a week at ENP and I miss the Ele’s. The experience has enriched my life and given me the motivation to do what I can to deter travel companies to promote Elephant trekking etc. Watching the Elephants, I could never get enough. Hope to visit there again some time soon.